The life around the Cubs hot stove is desperate and lonely. We, fans, are starving for feelings of pride and splendid anticipation for the upcoming season. Rumorville brings us no hope, as the foreseeable future brings us the gloom of signing Marlon Byrd, Scott Podsednik, Melky Cabrera, or that douche'r Rick Ankiel. I swear, less than 12 months after we gift wrap Felix Pie to old friend Andy MacPhail in Baltimore, we are combing through the dregs of garbage outfield options. I've always liked Jim Hendry. His work ethic is legendary, but sometimes you need to see positive results or at least a sound "process". For too long, we've been scratching our heads over his moves before the benefit of hindsight. He's turning into the Anglo Omar Minaya, and that isn't a complement. Where can the Cubs find another Jack Zduriencik? That's what we need. Enter the inspiration of Hee Seop Choi... Here is a guy who climbed the mountain to the Show of Major League Baseball. He reached cult-hero status on the Northside of Chicago but never achieved the glory of traditional stardom or, of course, championships. After being traded for Derek Lee, he toiled away in the Marlins system and returned to his homeland to play for the Kia Tigers. I'm hoping we can get through these trying times, as fans, by learning from the acquired wisdom of our old brother in arms, Hee Seop Choi. There is inspiration in the story we bring to you today. I won't muddle it with my own interpretation, but we can learn much about the healing powers of hard work, determination, and patience... 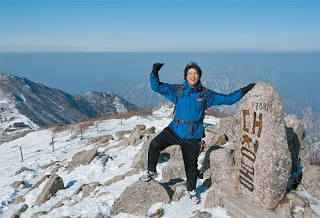 When you get a chance, please take a look at one of our favorite stops on the InterWeb, the Joong Ang Daily: "Athlete climbs to health on Mt. Seorak"
Go bless the Cubs, the fans, and God bless you, Hee Seop Choi.